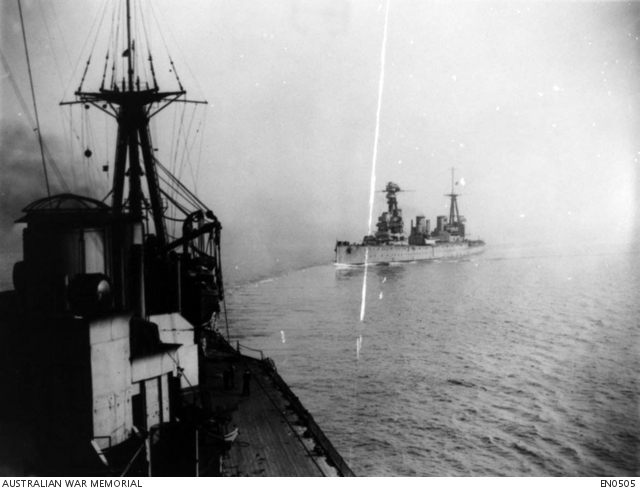 HMAS Australia at sea, followed by HMS New Zealand. Image courtesy Australian War Memorial. Sister ships HMAS Australia and HMS New Zealand are on patrol near Horn Reefs in the North Sea when they are enveloped by heavy fog. The ships, which had been zigzagging each other to elude submarines, collide. The collision puts Australia out of action until 9 June, causing her to miss the Battle of Jutland, the largest naval battle of the war. 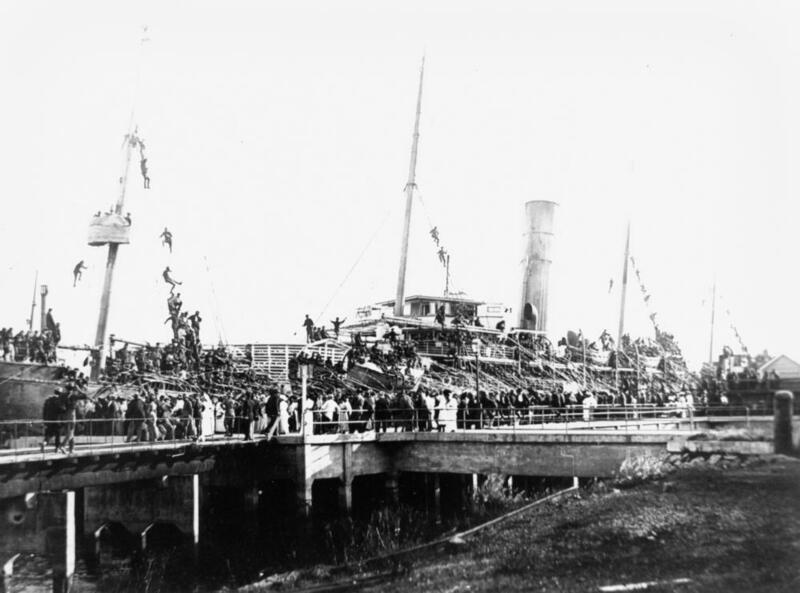 A third British attack is repulsed at Sannaiyat on the banks of the Tigris River in Mesopotamia. Hopes of relieving the besieged garrison at Kut-al-Amara are dashed. The attitude of England makes the provisioning of the population more and more difficult. In order to relieve the distress, the German Government has recently asked for volunteers to go to work in the country. This offer has not had the success anticipated. Consequently, the inhabitants will be evacuated by order and removed to the country. The evacuated persons will be sent to the interior of the occupied French territory, far behind the front, where they will be employed in agriculture, and in no way on military works. This measure will give them the opportunity of making better provision for their subsistence. In case of necessity, it will be possible to obtain provisions from the German depots. Each evacuated person will be allowed 30 kilograms of luggage (household utensils, clothes, etc. ), which it would be well to prepare immediately. I therefore order as follows: Pending further orders, no person shall change his residence. No person may be absent from his declared legal residence between the hours of 9 p.m. and 6 a.m. (German time) unless he is in possession of a permit. Since this measure cannot be recalled, it is in the interest of the population itself to remain calm and obedient. When Private Basil Nicholls died in France on 22 April 1916 he became the first person from the Orange district to die on the Western Front. The first Australian casualties of the Western Front had occurred two days earlier, when German shells bombarded the farmhouse at Rouge de Bois, where members of the 9th Battalion, C Company were billeted. Twenty-five men were killed in the attack, and 50 wounded, including Private Nicholls, who sustained injuries to his chest and abdomen. Private Nicholls was evacuated to the No 7 Casualty Clearing Station, where doctors performed an emergency operation, however Basil failed to recover. He died two days later and was buried in the nearby Merville Communal Cemetery. Born in Millthorpe in 1895, Basil was the first of two children born to Edward Randall Nicholls and his second wife, Annie (nee Bardoulean). Basil spent his childhood in the area and attended Calvert school. By 1915 Basil was working as a labourer at South Woodburn, Richmond River. 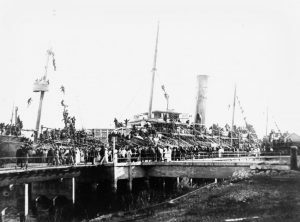 He enlisted in Lismore on 18 August 1915 and embarked for overseas service from Brisbane on the Seang Bee two months later with the 25th Battalion, 6th Reinforcement. Basil was hospitalised with influenza soon after disembarking in Egypt, spending Christmas in the 1st Australian General Hospital in Heliopolis. Basil was discharged to duty on 28 December 1915. In February 1916 he was transferred to the 9th Battalion, and on 3 April joined the British Expeditionary Force in Marseilles. Basil was in France for less than three weeks before he was fatally wounded, aged 22. Sadly, soon after his death Basil’s mother, Annie, received a postcard from her son, written en route from Alexandria to France, and posted in Marseilles on 12 April, ten days before his death. Later in the year Annie received two letters containing details of her son’s last hours; one from the sister in charge at the Casualty Clearing Station, and one from Basil’s commanding officer who assured her: “He made a brave struggle for his life, but eventually lost consciousness and died quite peacefully”. He added “Before losing consciousness he remarked that he was determined not to die as he must see his parents again”. Early in 1917 Annie received a package containing her son’s two identity discs, a wallet and some cards. A second package arrived in February 1918 containing more of his personal effects: a silk handkerchief, two books, two testaments, a prayer book, chevrons, cards, a letter, a magnifying glass, a kit bag handle, a metal matchbox and a balaclava. In January 1921 a memorial tablet in Private Nicholls’ honour was unveiled at the Calvert school. Made by the school’s students, the tablet was erected on the school room’s wall. In March 1934 Annie wrote to Base Records to say that she had lost Basil’s 1914-15 Star medal and asking if she could be given a replacement. She was informed that “War Office instructions preclude the issue of duplicate medals in the case of a deceased soldier” and advised to contact the state secretary of the Returned Sailors and Soldiers Imperial League of Australia to inquire whether the medal had been found and handed in. It seems that Annie never recovered the lost medal, she died in Richmond in January 1935. Basil Nicholls is commemorated on the Methodist Church Orange Honour Roll and on the World War I Roll of Honour on the southern face of the Orange Cenotaph. In 1923 the Anzac Memorial Avenue of trees was planted along Bathurst Road to commemorate fallen WWI soldiers. A tree was planted in honour of Private Basil Nicholls; it was donated by his stepfather, Henry Warburton. Very few of the trees are still standing today. 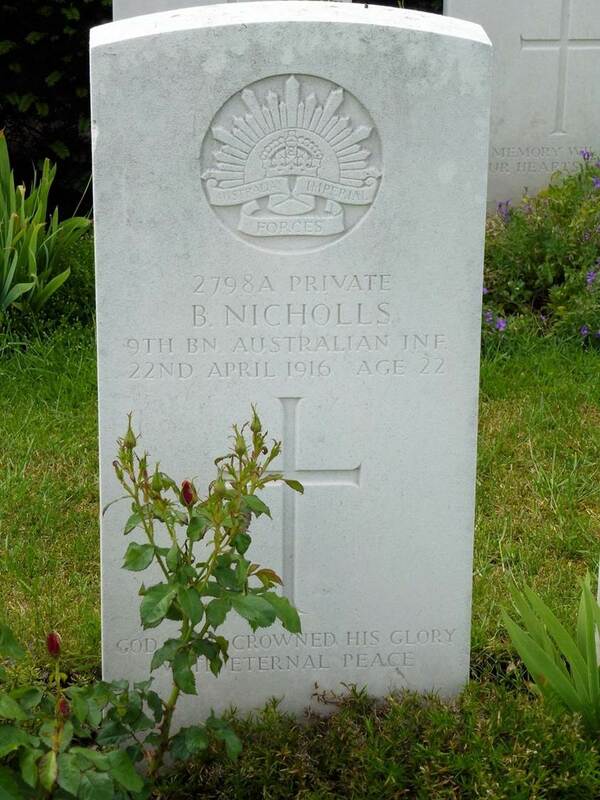 On 14 December 2016 Basil Nicholls was commemorated in the Last Post Ceremony at the Australian War Memorial. Leader, 10 May 1916, p. 1. 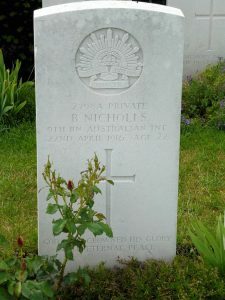 Basil Nicholls’ headstone, Merville Communal Cemetery, France. Image courtesy Sharon Hesse. 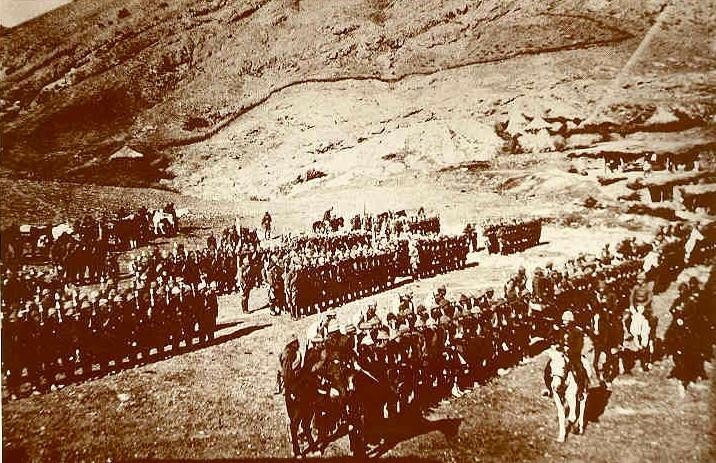 Turkish forces at the Bitlis front, March 1916. Image courtesy Republic of Turkey Government. German forces launch three attacks at Les Eparges northeast of Verdun; all fail. They do succeed in capturing two craters at St Eloi and positions north of Langemarck-Ypres. US President Woodrow Wilson threatens to sever diplomatic ties with Germany following the sinking of the British passenger ferry SS Sussex in the English Channel by UB-29. The German government later responds with The Sussex Pledge, agreeing to give adequate warning before sinking merchant and passenger ships. The pledge is upheld until February 1917, when unrestricted submarine warfare resumes. Alexander Murray Woods enlists. Alexander is commemorated on the Centenary of WWI in Orange Honour Roll; he would die of wounds in France on 10 August 1918. Edward Ernest Bingham [aka Bertram Lockley Tandy] enlists. Edward is commemorated on the Centenary of WWI in Orange Honour Roll; he would be killed in action in France on 19 April 1917. 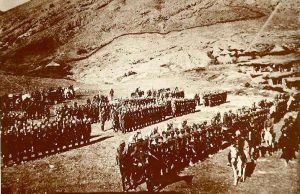 Commander of the Anglo-Indian relief force, Major-General Sir George Frederick Gorringe, orders the Royal Flying Corps and Royal Naval Air Service aircraft to drop food and stores to the besieged garrison at Kut-al-Amara in Mesopotamia. This is the first time aircraft are used for such a purpose. The food drops do not meet the troops’ requirements; already suffering from malaria, dysentery and scurvy, Major General Charles Townshend’s men now face starvation. Men of Anzac! Name of splendour! And courage is despised by men. And that shell-lashed, wired sea. Makes they crown of glory sure. Not in vain at Anzac died. Making thee a Shrine, a place.